Impact Wrestling Teases The Return Of A Former World Champion - Wrestling Inc. Earlier today, Impact Wrestling tweeted out a statement teasing the return of a former world champion and guaranteeing that they will be in the main event at Impact Wrestling United We Stand on April 4. The individual will be revealed on this Friday's episode of Impact Wrestling. As seen below, the tweet reads, "A former World Champion in IMPACT Wrestling will return to main event United We Stand on April 4th! Find out who this Friday on IMPACT!" 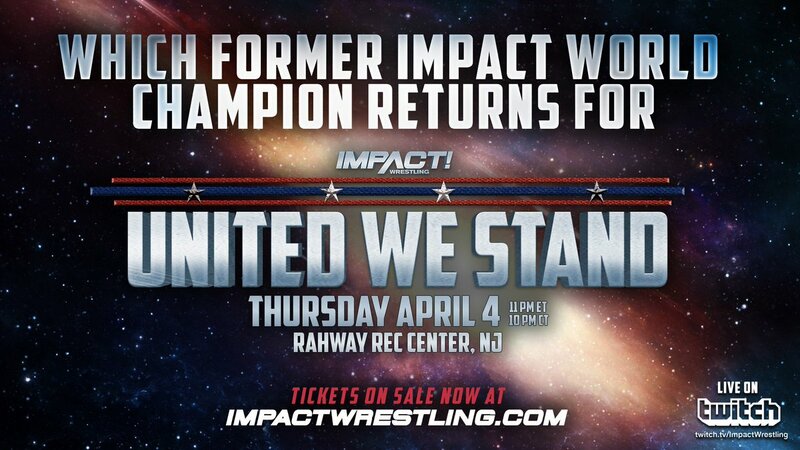 Impact Wrestling United We Stand takes place on Thursday, April 4th at the Rahway Rec Center in Rahway, NJ.